You also need to create and register a cvar called d_ditherlight. The theory is quite simple. The variables XY0a and XY0b means basically that we're filtering the dimension 0 (which is the only one) of the lighting along the XY coordinates of the destination. The a and b versions of the variable are just an optimization so we don't have to read the X coordinate on every pixel. Also, due to the nature of the surface cache drawing algorithm, X is always guaranteed to start at zero. And the shading for each color is unidimensional, so dimension 0 is all we need. 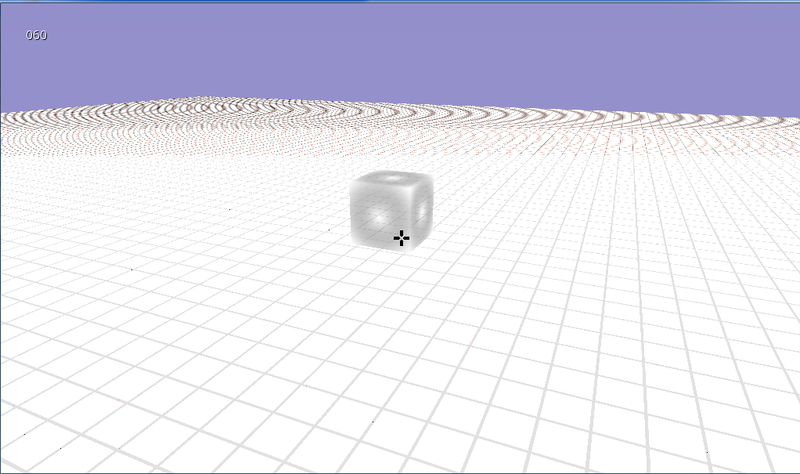 For bidimensional sources, like textures, the dimension 1 is also needed. As you might have guessed, this code doesn't work with colored lighting. But my intention here was just to increase the quality of the original lighting, and not to add more features to it. Also, don't forget to disable it on BSP entities that uses cel-shading, if your engine supports that feature. This dithering may look too sharp on distant mip0 surfaces, so setting d_mipscale to a higher value, like 1.4, may be recommended to reduce artifacts like this on the lighting. // in most cases, square textures are tiled, and non-square textures aren't. I'm wondering at this stage if there's better mileage in just biting the bullet and writing a 32-bit software renderer? One theoretical way of doing this is by drawing 3 views - one for each of the R, G and B channels - to offscreen buffers, then combining them during write-out to the back buffer. You'd need 3 copies of each colormap, again one for each of R, G and B, but that's a lot more lightweight than lots of huge LUTs. An optimization would be to run the vertex transforms and Z test once only, then only the actual drawing runs 3 times. You could even reuse the original ASM code for much of this. Well, this algorithm is blazing fast. The only change for each texel is using (light + XY0a) (or (light + XY0b)) instead of light. It should be quite slower than the x86 ASM version, but someone with enough skills could port it to Abrash's code. But the main point for me is that it keeps the original colors. In the screens I've posted, notice how the darker parts of the wall goes a bit cyan, and then goes somewhat between green and brown before going fully black. 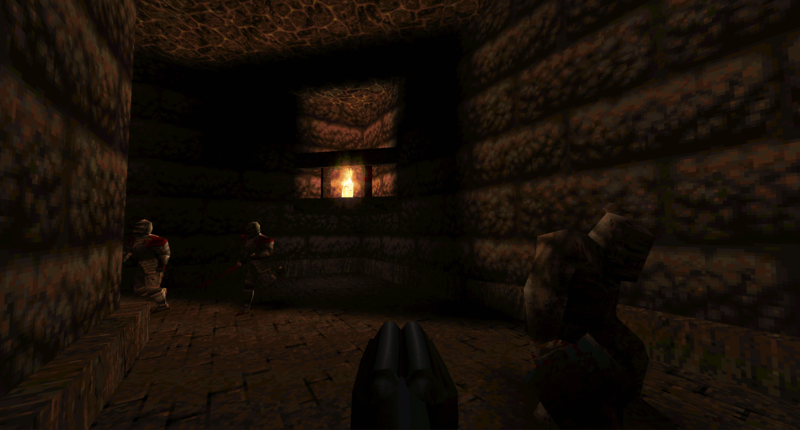 To me, this is part of Quake's visual identity. In the software renderer, the darkest spots of the game are actually very rich with all those different and somewhat unexpected colors showing up in the shading. It gives a better sense of the ravaged, desolated places where the player goes, because the darker it is, the more chaotic it gets. This is the same reason why I like this kind of filtering in PrBoom's software renderer, and always wanted to do the same in Quake. In hardware-accelerated engines, the shading looks too clean, too perfect, and that makes the atmosphere more bland. However, I often think about how to implement colored lighting, and it's a case where I agree that 24 or 32 bit color should be better. Maps with colored lighting are almost always made for hardware-accelerated engines, so using true color rendering for them is the best to make them look as their authors intended. About your ideas for optimization, the easiest way for doing that would be to switch the surface cache and virtual screen buffer for each color before calling the function to draw the spans. But since the dithered versions of those functions are in C, it would be more appropriate to convert them to 32-bit, using 32-bit surface caches. 32bit surface caches rock, although depending on surface caches means you're stuck with 'nearest' filtering (including dithered nearest sampling). you can do linear sampling with or without a surface cache - it just looks terrible in 8bit, and slow in 24+bit. mh wrote: One theoretical way of doing this is by drawing 3 views - one for each of the R, G and B channels - to offscreen buffers, then combining them during write-out to the back buffer. You'd need 3 copies of each colormap, again one for each of R, G and B, but that's a lot more lightweight than lots of huge LUTs. An optimization would be to run the vertex transforms and Z test once only, then only the actual drawing runs 3 times. You could even reuse the original ASM code for much of this. I was planning to do this same thing (and have error-diffusion dithering similar to what i did for models at the span level combining a lighting surfacecache with a texture surfacecache (along with planned lighting features to go in the buffer similar to deferred rendering)) but I had trouble with multiple buffers arleady with the water. You'd see lagged behind frames of them. Also I wonder what Makaqu's platform target is anymore. Is it still the Dreamcast? Is it still a 6th generation Win9x computer?